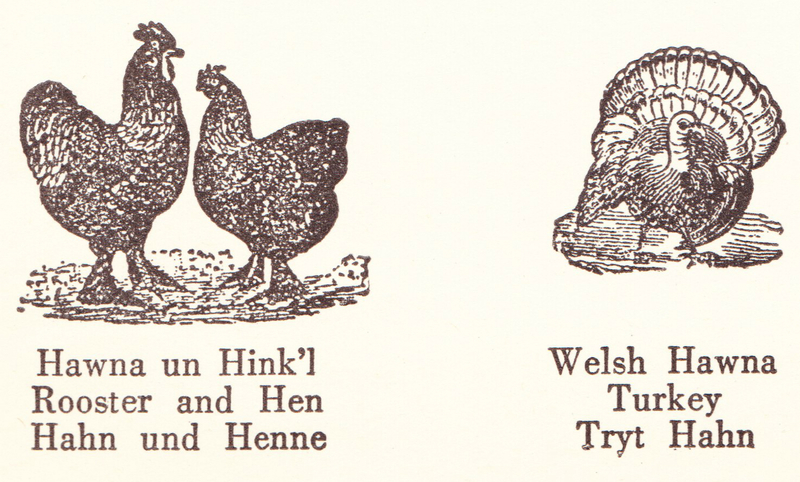 On this rainy, breezy September night in southcentral Pennsylvania, here are some excerpts and images from the Pennsylvania Dutch Cook Book of Fine Old Recipes. The cover of this staplebound book is mostly off and badly damaged, as you can see, but everything inside is in good shape, so I just need to enact some sort of cover preservation/restoration program. Maybe I can get a government grant for that. This 48-page book was published by William K. Dorman and Leonard Davidow of Reading, Pennsylvania, and there's no publication date. 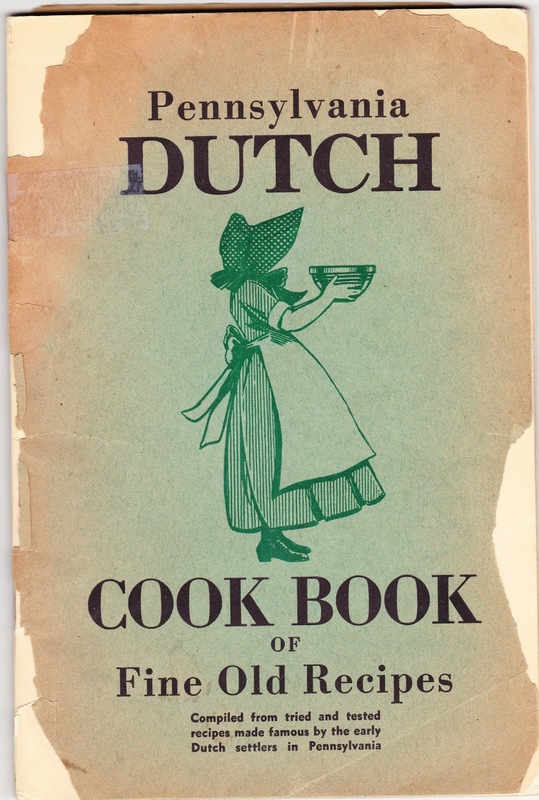 A note on the title page states: "The publishers will be delighted to receive recipes which are definitely Pennsylvania Dutch, which may have been omitted from this volume, for possible publication in a future edition." 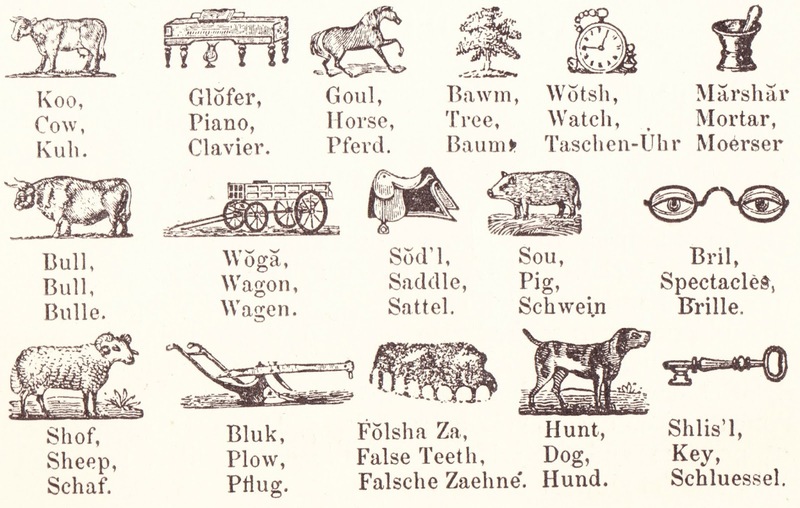 In addition to containing dozens of recipes, this book is filled with tiny illustrations accompanied by their labels in Pennsylvania Dutch, English and German. So, as you can see from the top of the post, the Germans call a turkey a tryt hahn and the Pennsylvania Dutch call it a welsh hawna. I included another series of these illustrations and definitions at the bottom of this post. First, though, here are some recipes for you to enjoy from the Pennsylvania Dutch Cook Book of Fine Old Recipes. Boil rabbit until meat is tender; separate from bones and cut fine. Make potato filling (see below) and place on a plate a layer of filling then a layer of rabbit meat with one tablespoon of dressing made from the juice from the rabbit mixed with flour. Make three layers with the rabbit meat on top. Put in oven and cook until brown. Boil and skin the potatoes, and mash. Mix with beaten egg and season well. Melt the butter in skillet and brown onion in it. Add the bread and brown. Mix in the parsley, celery, and green pepper. When thoroughly cooked together, add the potatoes and let cook for several minutes. A lump of cooking fat the size of an egg is melted in the bottom of the soup kettle. Into the melted fat stir ten level tablespoonfuls of flour, and continue to stir it over a low flame until the flour has attained a golden brown. Now add five cupfuls of cold water (slowly at first, to prevent lumping). When all is well blended ad salt and pepper to taste; cover the pot and allow it to simmer for two hours. Sprinkle each bowlful with grated cheese just before serving. Boil beans until nearly done, then add diced potatoes. When potatoes and beans are boiled, drain off water. Then add milk and butter and serve. This makes a very good dish and the cost is low. To one cup of brown sugar add one cup of molasses syrup and one cup of water. Boil until it hardens when dropped in cold water. Just before taking from the fire add two ounces of butter and ¾ pound hulled peanuts and mix well. Pour into well-buttered tin. Wash and slice the apples into small bits. Boil until soft and press through a sieve to remove skin and seeds. Bring cider to a boil and then add pulp and cook until it thickens, constantly stirring to prevent scorching. Then add spices and cook until it is thick enough for spreading. Seal in jars.